Superyacht builder Holland Jachtbouw (HJB), based in Zaandam, The Netherlands, has signed a new order contract for a 51-metre classic schooner sailing yacht. The new HJB 51-metre superyacht is designed by Dykstra Naval Architects, styled after Rainbow II (later named Hamburg) built in 1897. Designed with both racing and cruising in mind, the traditionally styled schooner will displace 343 tons and will be built to modern Germanishcer Lloyd certification. Her aluminium hull is currently in build at Shipyard Made in Moerdijk, due to arrive at Holland Jachtbouw in early 2015. 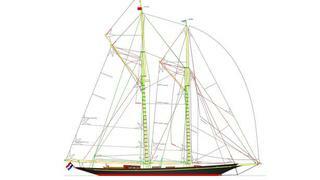 Meanwhile, the rig and top masts will be made by Ventis Enkhuizen. She will have a mast of 52 metres and a 25-metre boom. Upwind sail area will measure 1,523 square metres. The 51m schooner will benefit from technology Holland Jachtbouw developed for its spectacular J Class superyacht Rainbow – a hybrid drive that ensures silent running at night and can generate power to run systems overnight without the need for additional fuel. Holland Jachtbouw won a Design and Technology award during the ShowBoats Design Awards 2013 for this invention. The classic interior is by De Vos De Vries, and she will accommodate eight guests and seven crew members. Once launched in spring 2016, the yacht's maiden voyage will be to the Baltic for the summer, then on to the Caribbean for the winter season. Starting in 2017, she will be seen in more remote parts of the world and as well as an active participant on the racing circuit.